On August 23, returning students and staff welcomed 100 fewer students than they did last year. Last year’s class had 677. 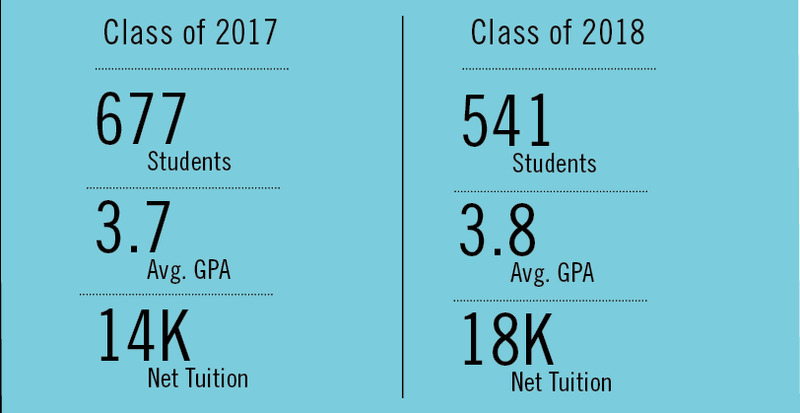 This year, there are merely 541 incoming students, and 37 of them are not even first-years. Seventeen of that 37 are transfer students and 10 are “special international students,” meaning they will only be at DePauw for a year. The Office of Admission and Financial Aid shot for a class size comparable to last year. “I think we always aim for a class of about 650 students,” said Cindy Babington, vice president for admission and financial aid. At the Faculty Institute on Aug. 22, University President Brian Casey said that DePauw University increased its selectivity and accepted five percent fewer applicants than last year. The current first year class had an average high school grade point average of over 3.8 while the class of 2017 had an average of about 3.7. DePauw admitted 119 fewer applicants that had below a 3.2, which resulted in a loss of about 35 to 40 students, Casey said. In line with raising the average GPA, DePauw decreased the amount of merit aid awarded to applicants with a GPA lower than 3.5. Casey said that students with a 3.2-3.5 GPA are generally more price sensitive when choosing schools. Of the students DePauw admitted within the 3.2 – 3.5 GPA range, many were also admitted to schools like Ohio Wesleyan, Wabash College and Denison University, where they may have received more merit aid, Casey said. Even with the changes to merit aid, the amount of aid was not necessarily decreasing, but the standards for giving it were changing. “We are still giving out a lot of aid,” he said. The third change that resulted in the smaller class size is that DePauw attempted to bring its net tuition in line with their peer schools, so need-based aid was decreased. Other Midwestern liberal arts schools typically bring in more money than DePauw, and DePauw was looking to close that gap. However, some programs and factions of the university still fared well. Enrollment in the School of Music is up 39 percent. The programs of distinction, such as the Honors Scholar Program and the Management Fellows Program, and athletic teams saw steady enrollment. “What it seems like is students in those programs went through the admissions process and then had another touch on campus,” Babington said. She noted that students who visit are much more likely to attend DePauw. At the Faculty Institute, Casey explained what lessons he felt could be learned from the experience. He said that there are two main pools of applicants: those who are regionally located and price sensitive when choosing schools, and prestige-oriented students who are less likely to choose a school based on the cost. Casey said that the majority of applicants would ideally not consider price as the primary factor in selecting their school. However, net tuition has increased. While last year it was about $14,000 per student, this year it is up to $18,000. Sophomore Felix Amankwah, however, feels that more people need to know about DePauw. The academic program, student outcomes such as successful alumni, the endowment for student aid and the campus will be the focus this year. At the institute, Casey stressed that class size isn’t everything and that it is an obstacle that can be surpassed. “Admission reflects the institution. It isn’t the institution’s mission,” Casey said.